It’s been a little over a year since I reviewed the first Peppermint OS, and while I liked the first effort on this new project, I’ve been really looking forward to Peppermint Two. Well, my wait was over as of last week, so I was able to kick the tires and get a good feel for it after installing and using it for a few days. In this review, I’m going to go over the basic stuff first, and cover the things Peppermint Two comes with and how it is out of the box, and then I’ll go into what I think of things with respect to stuff I didn’t like, stuff I did, my overall opinion of the OS, and finally I’ll have a bunch of screenshots at the end, so they’re all in one place (well, with one exception, which is just below). I took a lot of screenshots this time, and you’ll find shots of a lot of what I’m talking about in this review, so be sure to browse through them and have a look. Peppermint Two is nice to look at, so give them a glance or two! Like Peppermint One, Peppermint Two is a “hybrid” OS… that is, it’s cloud-oriented, lightweight, and slim with respect to overhead, resources, and pre-installed apps, but it’s built on a solid Lubuntu core that allows the user to install whatever they need via the repositories and still be a full-featured OS if that’s what one needs. It’s available as a free download on the Peppermint OS website, or, if desired, you can buy a CD for a pretty reasonable price. I downloaded the 32-bit ISO that the Peppermint team was kind enough to share with me last week, and burned it to CD normally. The ISO was smallish, being only 442 MB, so it fit easily on a CD after a swift download. This is where I encountered my first issue: the Live CD didn’t work on my test laptop. The boot screen would come up, giving me a number of options, including “Install Peppermint OS” and “Try Peppermint OS live” and “check disc”. But when I selected the “Try Peppermint OS live” option so I could test it out without installing, it cranked away for a good 5 minutes or so, and eventually dumped me to a command line interface and not a lot to do from there. I tried running “startx” to see if I could get X running manually, but that didn’t work. After a couple more tries, I determined that the Live CD portion was just not going to work on this laptop. I found this to be odd, because I’ve never had any other Live CD — including Peppermint One — not work on this laptop before. I tried the Live CD option out on my newer laptop, and got the exact same results. Again, I’ve never had any Linux Live CD of any sort not work on this laptop either, so I thought maybe there was something wrong with my burn. I ran the “check disc” option from the Peppermint Two CD and it didn’t seem to find any problems, and in checking around the web I’ve seen a few other reports of almost the exact same problem, so I think there must just be an issue with how the “Try Peppermint OS live” portion works or loads. At any rate, I have been planning on wiping my old test laptop for some time anyway, so I figured I’d bite the bullet and try installing anyway. In my experience, I have on occasion found stuff that didn’t work right on the Live CD but worked fine on installation, and vise versa, so I figured worst case scenario, I would end up with a non-working system and I’d just install Peppermint One on it again. When I tried the installation option, the installer loaded fine, presenting me with what appeared to be a pretty standard Ubuntu-esque installer. I selected my language, keyboard layout, partitioning options (I blew everything away and let it do a default, clean install) and then let it do its thing while I watched. The installer had a nice, interactive slideshow with good info about featured applications, where to find help in the community, and what the Peppermint Two OS is really about. The installation finished in about 15 minutes and kicked out the CD and performed a reboot. The first bootup was just as fast as Peppermint One booted on this same laptop, and as I had suspected, the installation (unlike the Live CD) actually worked just fine. Just to see if Peppermint Two was comparable to its predecessor, I immediately shut it down and did a cold boot to time how long it takes to come up, and I wasn’t disappointed. Peppermint Two on this old laptop takes 33 seconds from the point that I press the power button to the point where I can log in. Snappy! Shutdowns still take about four seconds on this laptop, which is something else I really like. Nobody likes waiting around for a machine to shut down after they’ve finished doing their thing. Four seconds is a great time for this process, no complaints there. And as a bonus, from login, the time to a usable desktop is practically instant. It’s responsive right away. And there’s this. Like Peppermint One, this version is remarkably light on resources out of the box. Check out this screenshot. I installed htop because I like it better than top. 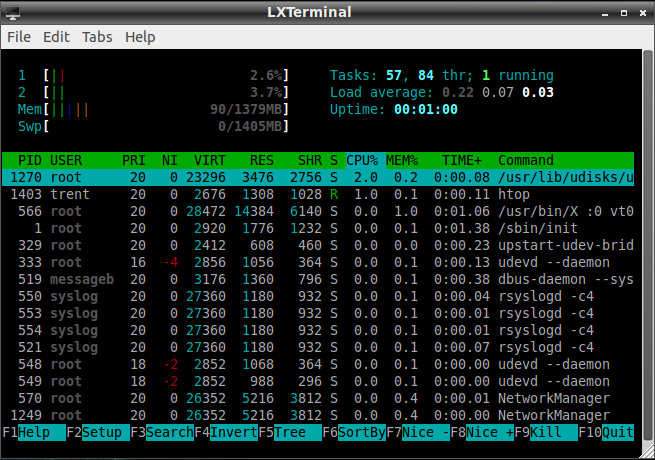 After a cold boot, htop shows only 90 MB of system memory in use after logging in with no other applications running!!! Wireless worked out of the box with no problems at all finding and connecting to my home wireless router. Peppermint Two, like Peppermint One, uses LXDE as its desktop environment. Fast, simple, and easy to use, LXDE is one to watch these days, as it makes pretty intuitive sense to even non-technical or non-Linux users — my wife has been using this laptop regularly with Peppermint One on it for the past year and she’s had no problems whatsoever with the LXDE environment. Plus, with its resource-friendliness, LXDE was a good choice for Peppermint’s default desktop. As such, PCManFM 0.9.9 is the default file manager, which, like LXDE itself, is fast, lightweight, and simple. It doesn’t have a lot of configuration options, but if all you’re looking for is the basics, PCManFM delivers better than most in my opinion. Unlike Peppermint One, which shipped with Mozilla Firefox as the default browser, and Mozilla Prism for the “site specific browser” webapps that worked so well, Peppermint Two is based completely around the Chromium browser, and a custom Chromium-based app called “Ice” that is basically the Chromium equivalent of Mozilla Prism. With respect to installed applications, again like its predecessor, Peppermint Two is pretty light, relying largely on these Ice-based site specific browser “webapps” for a lot of things. So instead of an office suite of any kind, there’s a Google Docs webapp. Instead of an installed local mail client, there’s a Gmail webapp, and instead of a locally installed Twitter client, there’s a Seesmic webapp. In addition to these, there is also an Ice-based webapp that goes straight to the Peppermint OS forums, which is nice (especially for someone looking for help with something, or just interested in being a part of that great community of other Peppermint OS users), and there’s a webapp for Pixlr (which I used to crop and resize and thumbnail all of the screenshots I made for this review) and webapps for Last.fm, Youtube, and The Cloud Player. All of these work surprisingly well in my playing around with them. A lot of this stuff is Flash-based, and I had no issues whatsoever with any of the Flash content in these Ice-based webapps. There are other, locally installed applications, however — this is still a “hybrid” approach, combining the cloud and local apps, remember? So, we have Gedit for text editing, which is pretty familiar to any GNOME users out there. XChat is also installed by default, which auto-connects to the Peppermint IRC server when launched. I thought this was a nice hand extended for support and community for users new to Peppermint OS. Speaking of the cloud, Dropbox is installed, so if you have an account, you’re only a few clicks away from configuring it to pull and sync your data. If you don’t have a Dropbox account, you should make one. It’s free, you get a couple of gigs of storage space for free to begin with, and they give you bonus space if you refer others. I’ve been using it for over a year now and I find it tremendously useful and easy to manage. I discovered that Guayadeque is installed as a music player, and I found it surprisingly full-featured for a lightweight OS such as Peppermint. GNOME-mplayer is also installed by default, for playing local video content. There is no instant messaging client installed out of the box in Peppermint Two, but there is an Ice webapp called eBuddy Web Messenger, which I found kind of novel, because I’d never heard of it before this test run of Peppermint Two. I don’t do IMing, but it appears from eBuddy you can sign into a variety of instant messaging services if you have an account, which I think is pretty cool (as compared to running a local IM client like Pidgin or something). I didn’t play around with it much, but I thought it was a nice option. I have the exact same problem with the live cd, both on my new thinkpad and an old FSC. it’s inherited from lubuntu because the latest version of that distro would not boot into live cd either. and i can’t seem to figure out how to fix it. it’s a pity, i meant to give it a spin. Yeah, in some further Googling I did yesterday, it seems to be connected with the Lubuntu upstream issue. just install it into VirtualBox to give Peppermint a test run. that’s what VirtualBox was made for! I found that of you choose install, go through a step or two and cancel, you can boot in to the live CD. I had the same problem, but I did another download ot the ISO a couple of days after the first download, and finally it worked. Live CD worked fine for me! Live CV worked on eee 904HD, eee 900a and an old Dell Inspiron 1150 when I was testing / playing around! DVD issue is a non issue if you install VLC……. While this is true, I was more concerned with testing this in as close to “out-of-the-box” condition as possible, for purposes of this review. how to install apps in peppermint os.. I had the same problem with the lubuntu 11.04 live CD. After four coasters and a little searching online, it turns out that you need to burn the CD at a slow speed. I used Brasero, chose the lowest speed and got a working live CD. Live CD worked for me. This is a fast OS. I tweaked mine for autologin and removed some autostart programs as I don’t have bluetooth or a printer and such. Also removed thosed corresponding services from startup. Seemed to speed everything up slightly. Only defect I have been having is if I do a reboot it renders my os useless and I am forces to do a hard shutdown. As long as I do a regular startup and shutdown everything is amazing. So far I am the only one with the f’d graphics when selecting reboot as far as I know. Hope a fix comes out for it. make your taskbar semi-transparent and change your wallpaper and you are good to go. Email me if you need some advice. You can always get Bodhi Linux, but it is not as user friendly but it compares to peppermints speed. WattOS is slower but user friendly. Still faster than Ubuntu or Linux Mint. MacPup is also very fast, but confusing for noobs trying to learn. Also a difficult install if you don’t know what your doing. Those are my top 4 at the moment. Peppermint still wins. I think I am going to try Peppermint Ice and see if I still have the graphics issue. Peppermint OS is nice and reliable to use. Although is does not have as many applications like Microsoft, but performance is better.